More than 200,000 students in the West Midlands have been educated about the dangers of knife crime since 2010. The Precious Lives Project, funded by the Police and Crime Commissioner David Jamieson, works with young people in schools to divert them away from youth violence. Whilst primarily focusing on knife crime, sessions also cover anti-social behaviour. As part of the scheme Alison Cope, a mother from Birmingham whose son, Joshua, was tragically stabbed in September 2013, tours the regions' schools telling her story. The aim is to warn youngsters about the dangers of carrying knives. 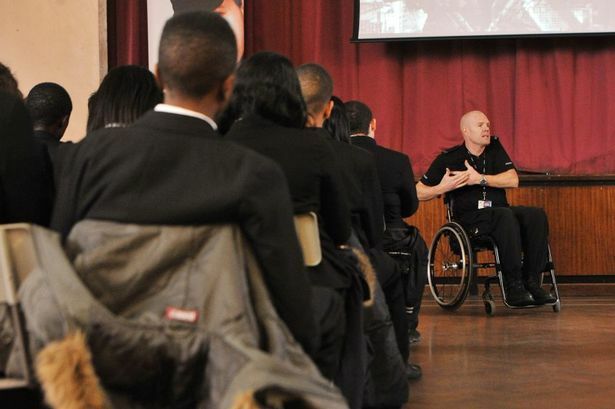 The sessions aim to reduce youth violence and prevent young people from becoming offenders or victims of violence. Since 2014 knife crime has almost doubled. Praising the excellent work carried out through the Precious Lives project, the West Midlands Police and Crime Commissioner, David Jamieson, said: "Teaching our young people about the dangers of carrying knives is of the utmost importance. "I firmly believe this project is saving lives. "The initiative is doing some excellent work. Alison Cope and PC Rob Pedley are able to reach out to young people at an early age and steer them away from violence and crime. "We must all work together to tackle this issue and protect lives." The scheme reaches out to some primary school aged pupils as young as 10. Alison Cope, whose son Joshua Ribera was murdered in 2013, said: "I aim to educate young people in the West Midlands, not only about knife crime but on the importance of choices, love and hope. "I share the life story of my son Joshua and how through positive choices he achieved many things, but then how another person's choice ended his life. "I have received many cards, letters and feedback saying how the presentation has made people think differently about many things from carrying a knife to showing love to their families. One young person the project reached described the impact of the session he attended: "The assembly really inspired me and told me to live and love my life. "We were told that you don't need a knife to protect yourself, you need your confidence to walk away and tell someone." PC Robert Pedley, who set up and runs the project, said: "Most areas of the UK have seen an increase in knife crime and young people are telling us they carry a knife to protect themselves, but the reality is that carrying a knife has consequences that destroys lives and families. "It's our goal to change the attitude of a generation by offering real life information and reduce the attractiveness of this type of crime".